I’m just going to say it: I’m a pro at doing Walt Disney World. I’ve been visiting the parks since I was in the womb and 28-years later, I’m still going strong. There isn’t one secret about the parks I don’t know and to further prove my expertise, I can pretty much walk the entire layout of the Magic Kingdom blindfolded. Becoming such an expert on Disney, though, took a lot of practice – and making a few rookie mistakes along the way. Here are 15 Disney World Tips from someone who has done it all. I’ve stayed off property a lot growing up, and it was always a fun experience. However, in today’s day and age, you aren’t really saving that much more money by staying off property than you are on. Staying in a Walt Disney World Resort hotel guarantees you free transportation to and from the parks, other resorts and Disney Springs. Furthermore, if you stay off property and drive your personal vehicle to the parks, you’re going to have to pay for parking. This can be exacerbated if you purchased a Park Hopper, meaning you’ll have to pay per each park you visit. If you visit multiple parks per day this can be quite costly! Guests staying on Disney property have access to Extra Magic Hours which enable visitors to gain access to the parks before and after closing. While you may be saving some money by staying off property, you’re missing out on some great conveniences. One of the biggest rookie mistakes guests make when going to the parks is wasting FastPass on rides that don’t require them. This is not to say that there are only certain rides that have lines and the rest have no wait; that’s not true. However, there are certain rides that have a higher popularity than others meaning that the wait time is going to be longer and more substantial. Do your research on what rides are currently trending at Walt Disney World before your vacation. For example, when I visit in October, I know that the newly opened Toy Story Land is going to be insanely popular so I’m going to want to get a FastPass for rides like Slinky Dog Dash rather than waste it on the Twilight Zone Tower of Terror, which during Fantasmic! may only have a 25 minute wait time. Regardless of the time of year you go, you’re still going to fall victim to the Florida heat and humidity. The best thing you can do in Walt Disney World is staying hydrated, but it can become quite costly to buy water bottles throughout your trip, especially if you’re buying for a family of three or more. My recommendation is to bring your own reusable water bottle and fill it up throughout the day. It’s a cost-effective way to stay cool on your vacation. The same goes for snacks you can purchase ahead of time and bring with you. It can be hard to wait until 8:00pm to take a ride on Splash Mountain or whirl through space on the iconic Space Mountain, but from experience, it’s best to do so if you want to cut back on your wait-time. Now, this is not a secret so chances are you may still have to wait in line to enjoy these rides, but it will be significantly less once more and more people gather around Cinderella’s Castle to watch the fireworks. Personally, I think this applies to every park that ends the night with a popular display. Hang in there and try to wait until the show starts to ride those favorite rides. You may even be able to ride them twice. There have been countless times I’ve ridden the Twilight Zone Tower of Terror in succession while fireworks were taking place. So, whenever I go to Walt Disney World, like you, my main goal is to get on my favorite ride, chomp down on a Turkey Leg, or watch a parade. However, by whizzing through the parks in an effort to get to the next attraction, chances are you’re missing a lot of the magical touches Disney has to offer. For as many times as I’ve been to the Magic Kingdom, it wasn’t until two years ago that I actually realized there was a photo opportunity with the Sword in the Stone right in Fantasyland! There are countless photo ops you can encounter within the parks if only you stop to find them. As much as it may not sound like fun to take a leisurely stroll throughout the parks, it’s necessary to discover how much thought these Imagineers really put into the parks. It should go without saying that the shows at Walt Disney World can’t compare with the rest of the outside world. Still, though, they can be easily forgotten when compared to the amazing rides around the park. They’re not only entertaining, but a great way to cool off and get some rest from walking around the parks. I recommend all of them, but my absolute favorite is Mickey’s PhilharMagic in the Magic Kingdom. For as many years as I’d gone to the Magic Kingdom, I only tried Dole Whip and a Turkey Leg recently. I kept forgetting about them, only to remember when I was outside of Magic Kingdom, realizing I hadn’t tried their famous Dole Whip. The lines for these items can become quite lengthy because of their popularity, but it’s worth the wait. Do your research and be sure to try their iconic snacks like a turkey leg, Dole Whip, churro and Mickey-shaped ice cream bar! They make for great photos, too. It goes without saying that the pools at your Walt Disney World Resort hotel are beautiful and unique to your hotel’s theme. I’ve stayed at so many throughout the years, from Disney’s Old Key West Resort, to Disney’s Caribbean Beach Resort, Disney’s All-Star Resorts, Disney’s Port Orleans Resort – French Quarter, and more, each pool experience has been unique and exciting. A Walt Disney World Vacation is not overly relaxing considering you’re constantly on the go, go, go. You’re spending the money to stay at one of their lovely resorts, so get your money’s worth and actually enjoy it! You’ll feel rested and ready to start your day at the parks again. Regardless of your itinerary, paying the few extra dollars for the Park Hopper option is worth it. It enables you to plan your day uniquely, allowing you to have breakfast in the Magic Kingdom, lunch in the World Showcase in Epcot and finish off the night with the Rivers of Light in the Animal Kingdom. I love the freedom of being able to jump around from park to park in a single day. Sure it’s tiring, but it’s a ton of fun especially if you’re spontaneous, like me. I hate to call any ride or experience in Walt Disney World “lame” but the truth is that there are areas that are in need of desperate renovation. I’ve spent time hiking on the Swiss Family Treehouse and Tom Sawyer’s Island, and while they’re neat experiences, they’re beyond outdated and chances are, references your children won’t even know (or appreciate). Don’t waste time on these attractions that could be spent on something else. Linking your credit card to your MagicBand has several benefits. One, it makes purchasing so much easier and eliminates the risk of leaving your card on the counter. Secondly, though, it eliminates the need to bring your purse into the park. If you’re like me, you’re lugging your bag with you. This means having to stop and have it looked at upon entry to the park, plus carrying it around with you the entire day which can get very heavy. Furthermore, it can become an aggravation trying to store your purse or backpack on each ride you go on. Trust me, go ahead and eliminate the hassle completely. I’ve done spontaneous, last-minute trips and while fun, we couldn’t get into any of our favorite restaurants or get a FastPass for popular rides – in our case the Flight of Passage in Animal Kingdom. By booking your trip early, it gives you the opportunity to book dining reservations up to 120 days in advance and FastPass selections up to 60. It’s a great way to guarantee the most out of your experience. Plus, if you book through the My Disney Experience website, it’ll provide you with a countdown to your magical vacation. That always adds a big smile to my face! While you may not need a reason to visit Walt Disney World, many people visit to celebrate different milestones. 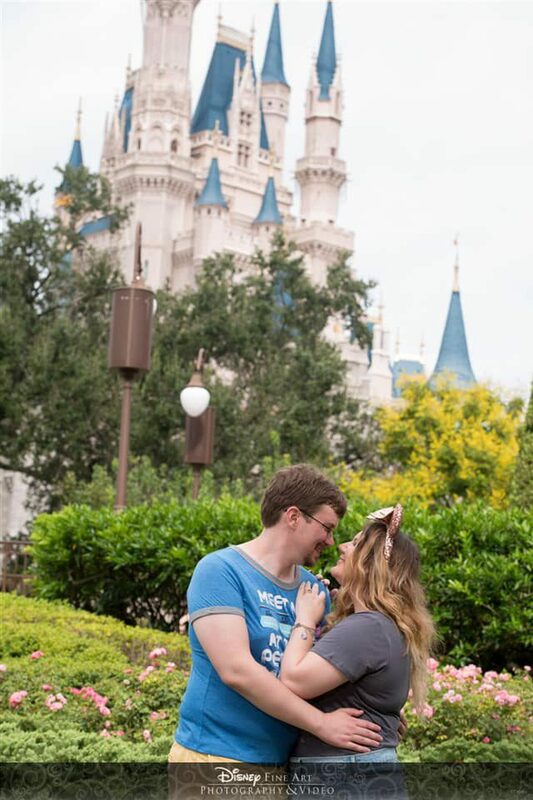 Whether this is a first visit, an anniversary, birthday, graduation or honeymoon, Disney offers personalized gifts you can order to surprise your children or significant other. I did this for my honeymoon and have a little gift bottle of wine and matching glasses for us to celebrate our marriage. It’s just another way you can make your trip more memorable. I remember my parents doing this for me on one of my childhood vacations and I’ve been hooked ever since. It was so cool walking into the hotel room to me very own Mickey and Mickey toys to play with. While I’ve been to the parks countless times, I only used the Memory Maker this past December. I fell in love with it. It gives you access to every photo taken on rides such as Splash Mountain, but different photo opportunities across each and every park. It’s a great way to download and share with friends and family all the magical memories you made in the Happiest Place on Earth. While there are so many other good tips from a girl who’s done everything you can imagine down Disney, here are a few of my favorite. I hope they help add a little bit more magic and ease to your upcoming vacation. Please visit this post on How to Disney and check out my other articles on Walt Disney World.